Come and play in the park with us! There will be food, beer, bounce houses, a kids fishing derby (there's a lake), music, adult and kid games, and MORE!! Bring a copy of this invitation or show it on your phone for FREE entry and drink tickets. Please join us! Join East Valley Mom Nation and Team Evolution for our October Movies on Main! We will be having a costume party and contest so dress your best! Please arrive at 6:30 sharp to ensure you find the best seats to fit your need! **NEW LOCATION*** This event will be held at the Idea Museum, in the Atrium!!! Please be sure to enter off Robson! The museum will be closed for a private event. Our new location is closed off, has an amazing grass area, and will be perfect for our HUGE screen and professional sound system! Bring a blanket or chair so you can get comfy while enjoying Hotel Transylvania 2!! Watch as our Expert Associate Broker, Katie Lambert provides us with a guided tour through one of the most tasteful Team Evolution Phoenix flip homes! Mesa Historic Home Tour! Sign up now! Come join Team Evolution Real Estate for our open house on 1/31/15 from 11-3 P.M. Welcome to one of the most highly sought after homes in the Evergreen Historic District of Mesa. There truly is no home in the Valley of the Sun that is quite like this one. The home has been the stage of many TV commercials and professional photo shoots for a variety of uses and media. Step inside and you'll see why... The wide, treelined streets, the gathering of an eclectic variety of bungalow homes, and the quaint, tight knit community of neighbors complete the feel of times past while incorporating the convenience and amenities that a modern family requires. Built by a medical doctor in 1904/1905 when Arizona was still just a territory, the home has been renovated since yet special attention was paid to restore some of the original qualities of the home. The original wood flooring in the formal living room still exists today as do original windows, moldings, and built-ins. With nearly 3700 square feet of living space that includes a formal living room, family room, formal dining room, and HUGE bonus / game room, you can rest assured that there is room for the entire family to gather for holidays, celebrations, and visits. The historic warmth of the home is so inviting and comfortable that you may have to actually ask guests to leave when it's time to turn in for the evening! The remodeled gourmet kitchen boasts gas cook stove, built in refrigerator, stainless appliances, contrasting color two tone cabinets, built-in refrigerator, apron sink, wainscoting on the walls, white subway tile backsplash, and granite counters. All three bathrooms have been completely remodeled. One has a beautiful clawfoot tub that completes the feel from the Era. The very private master suite has been completely remodeled from flooring to bathroom fixtures and decor. In addition to the spacious privacy, the master suite offers a private balcony with views soaring over the rooftops of neighbors serving as the perfect romantic getaway. The roof over the 2nd floor has been replaced recently with shingles and the entire home painted inside and out with eye-catching custom paint colors. This little piece of historic paradise sits on an oversized lot with access to city irrigation. The options are endless from large family gatherings to baseball games with the kids on a lot of this size. Enjoy the coming and going of the seasons under the canopy of majestic, mature trees and vibrant green grass and shrubbery. The neighbors are friendly and some have been living in their homes for decades. This tight knit community feel lends itself beautifully to holiday celebrations such as Halloween and the Christmas season. More than 600 children visit Evergreen during Halloween and the streets are lined with lights and decorations immediately following Thanksgiving to welcome the coming Christmas season. If you are looking to rekindle the warmth and homey feeling of a visit to Grandma's in your every day life then this is it. You are home. The location is also quite convenient and up and coming. Downtown Mesa is within walking distance and is beginning it's transformation back to the bustling metropolis that it once was. New businesses have been opened and the the light rail is almost complete. Downtown Mesa is the home of the world renowned Mesa Arts Center, the historical museum, and many highly recommended restaurants including Nunthaporn's Thai Cuisine and the original Blue Adobe. The homes in the historic districts (there are 7 districts total) are being renovated and welcoming new families into the community. There is quite a vision among the community for the future of Downtown and the groundwork is being laid each day toward this vision. The Downtown Mesa association and the Mesa Chamber coordinate events on a weekly basis that interest all walks of life. This includes the arts, music, and family friendly events. This is a lifetime of fond memories, great neighbors, and charm all wrapped up in beautiful, Historic Downtown Mesa. Please feel free to contact the listing agent for more information on the growth and development of this area and Downtown Mesa. Come join Team Evolution Real Estate at our open house in this beautiful 1905 Historic Bungalow located in the Evergreen Historic District in Mesa. This unique neighborhood boasts treelined streets & wistful history. This gorgeous home features 4 bedrooms, 3 bathrooms, 3700 sqft, den/bonus room, formal dining room, family room, and living room. With a perfect combination of "old" & "new" makes this a must see home! 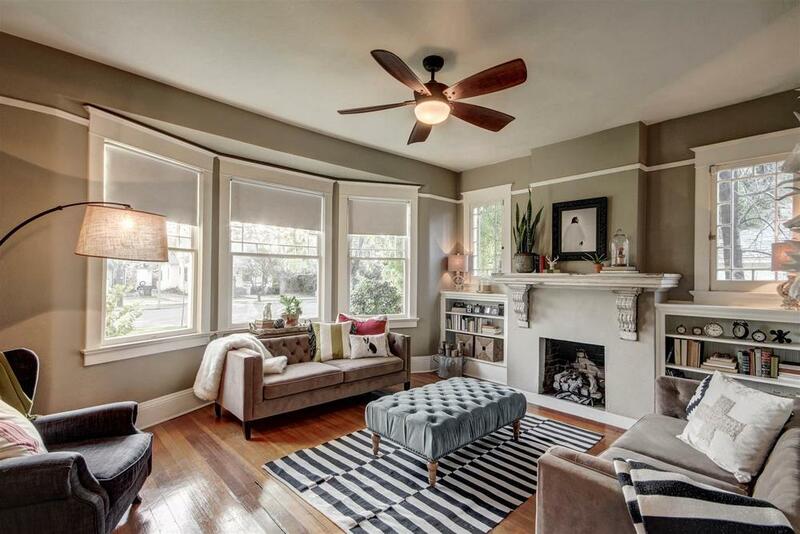 It includes the original picture moldings, beautiful built-ins, cozy gas fireplace, original wood flooring, and new kitchen cabinets with apron sink. SOARING VAULTED CEILINGS UPSTAIRS! MASTER BEDROOM IS HUGE. LARGE PANTRY, LIGHT OAK CABINETS! UPGRADED TILE THROUGHOUT THE MAIN FLOOR, JACK & JILL BATH FOR 2ND FULL BATH MAKES 2 MASTER BDRMS! BEDROOM DOWNSTAIRS COULD BE USED AS A FORMAL LIVING ROOM, FORMAL DINING ROOM, OR DEN.